The Steam page was correct. 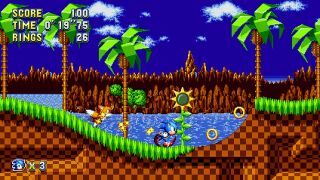 A few days ago, a Steam store page listing appeared to reveal the release date for Sonic Mania, Christian Whitehead and co's promising remix of the early, good Sonic games. Well, turns out it was correct, as the game is releasing, as suggested, on August 15. Here's a new trailer that a) reveals the launch date, and b) wants you to pre-order the game, in exchange for a 10% pre-release discount and, seemingly, nowt else. Pre-order or no pre-order, that is one lovely trailer—just look at that crisp, colourful pixel art. Sonic Mania was originally due this Spring, before being delayed to Summer a few months ago. It'll be accompanied this year by Sonic Forces, the 2D-meets-3D platformer that uses 3D models, and is seemingly modelled after the moderately well received Sonic Generations.